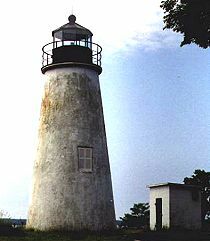 Turkey Point Lighthouse – Chesapeake Chapter U.S.L.H.S. Turkey Point Lighthouse is located in the Elk Neck State Park. It was authorized by Congress in 1831 and was built in 1833 with a tower and keeper’s quarters by John Donohoo. The tower is 35 feet high and is situated on a 100-foot bluff where the North East and Elk Rivers converge. Originally, the tower had a panel of red glass to warn ships they were approaching the shallows. The beacon was visible for 13 miles and was the highest of 74 lighthouses on the Bay. Only the lighthouse and the oil house remain, the keepers house was torn down by the Coast Guard. This lighthouse was the home of the last woman lighthouse keeper, Fannie Salter. She served from 1925 until she retired in 1947. The lighthouse holds the distinction of being tended by more women keepers than any other lighthouse on the Chesapeake Bay. Today the lighthouse is maintained by the Turkey Point Light Station, Inc. They have plans in the works to reconstruct the keeper’s quarters. When completed it will be fully habitable with a living museum on the ground floor. Displays will include artifacts about the Chesapeake Bay, Elk Neck and Turkey Point Lighthouse. Exit at Interchange 100 on to State Route 272 (North East Road) and go south 2.4 miles to State Route 7 (East Cecil Ave.). Cross State Route 7 and stay on Route 272. Go 11 miles entering the Elk Neck State Park. Go to the end of the road. There is a chain across the road at this point and a parking area on the left. Park in the lot and walk past the chain about 1 mile to the Turkey Point Lighthouse.